This is the ultimate of Australian wildlife tours: the very best locations for IN THE WILD animal viewing with Australia’s top Wildlife Guides. 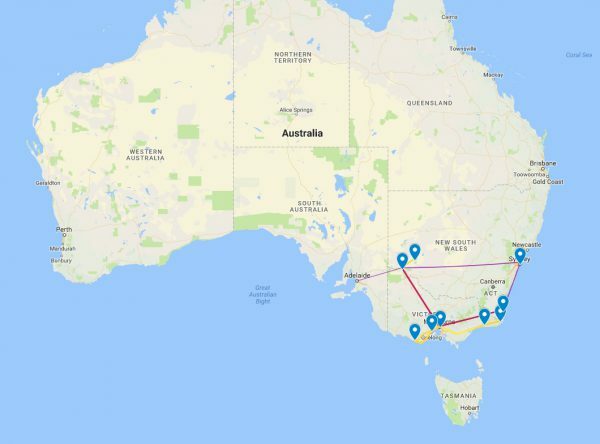 Travel to Australia’s best locations for maximum wildlife diversity – the coastal wilderness and world biosphere reserve of Croajingolong National Park, the rainshadow woodlands of Snowy River National Park, the famous wild cliffs of the Great Ocean Road, and the desert Outback with World Heritage Aboriginal History. From rainforest to desert, from coast to mountains, from lyrebirds & shorebirds, wallabies & wombats to brilliant parrots, emus, koalas & kangaroos – this is the best Australian wildlife vacation package. This wildlife package is customised to you. Choose from 7 days to 21 days; in the regions best suited to your interests, timing and budget; all private or all shared tours; focus on birds, reptiles, mammals or all of them; photography, scenery, or walking. This tour starts in the Northern Territory Top End, exploring Kakadu and Mary River National Parks over 6 days. 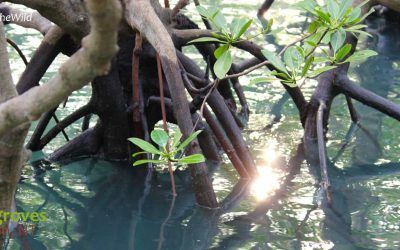 Saltwater Crocodiles, Agile Wallabies, Jabiru (Black-necked Stork), Dingoes and Brolgas are some of the highlights of this spectactular region. Next stop is the Outback, at Mungo National Park in New South Wales, for 4 days. 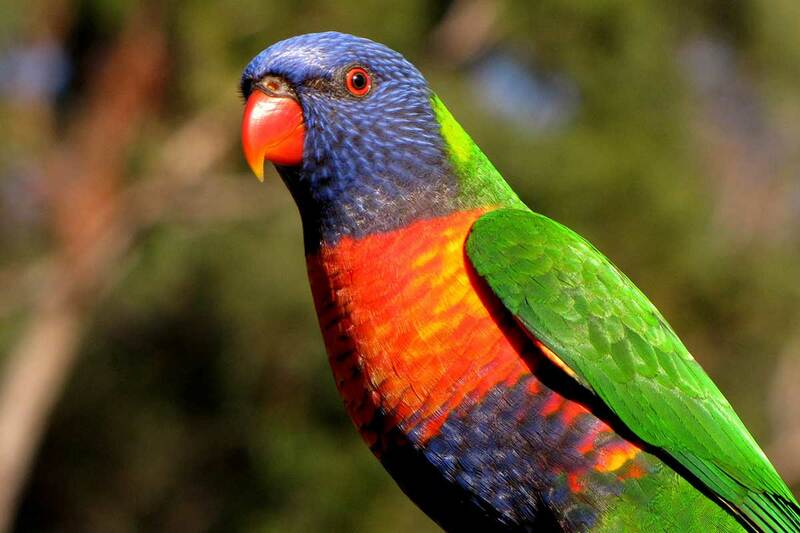 Highlights includes many kangaroos of two species – Western Grey & Red, Major Mitchell’s Cockatoos, Mallee Ringneck, Bluebonnet and Mulga Parrots and Central Bearded Dragons. The Aboriginal History of this region is ancient and fascinating too. To the coast at the famous Great Ocean Road – a region known for its scenery, but also a hotspot for wildlife. Koalas, Eastern Grey Kangaroos, Cape Barren Geese, Emus and Rufous Bristlebirds are some of the exciting species we see. Finally to East Gippsland – the wildlife jewel in the crown – for 8 days. 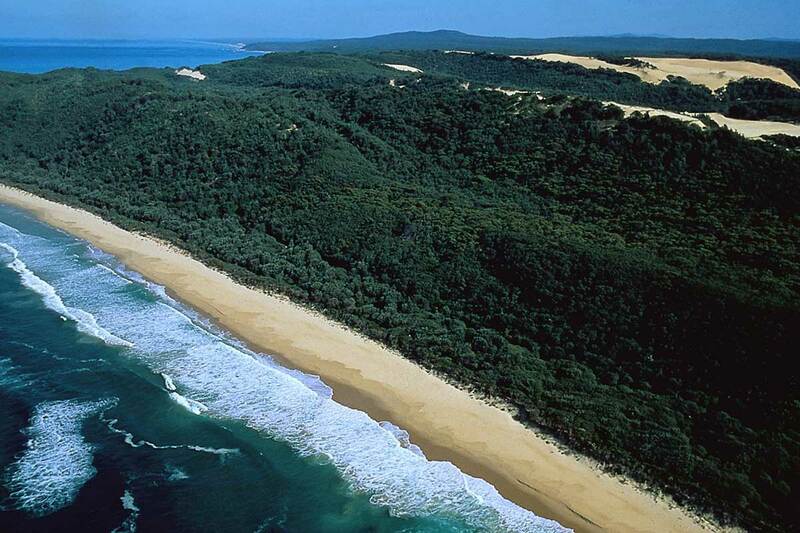 This coastal rainforest and mountain forest region has the highest bird count in Australia for its size. Superb Lyrebirds, Wonga Pigeons, Echidnas, kangaroos and wallabies, wombats, seals and dolphins, Eastern Whipbirds, five or more species of cuckoo, goannas (Lace Monitors), Gippsland Water Dragons are just the start. This Australian tour is tailored for your interests, party size and duration. Contact us to request a quote. This package can run as All Private (ie just for your party) or Part-Shared/Part-Private. Shared tours operate at limited frequencies, so contact us early in your trip planning if you can. Shared tours operate with a total of 8 adult passengers. Start in The Desert Outback, at Mungo National Park in New South Wales, for 4 days. Highlights includes many kangaroos of two species – Western Grey & Red, Major Mitchell’s Cockatoos, Mallee Ringneck, Bluebonnet and Mulga Parrots and Central Bearded Dragons. The Aboriginal History of this region is ancient and fascinating too. Finally to the rainforests of East Gippsland – the wildlife jewel in the crown – for 8 days. This coastal rainforest and mountain forest region has the highest bird count in Australia for its size. 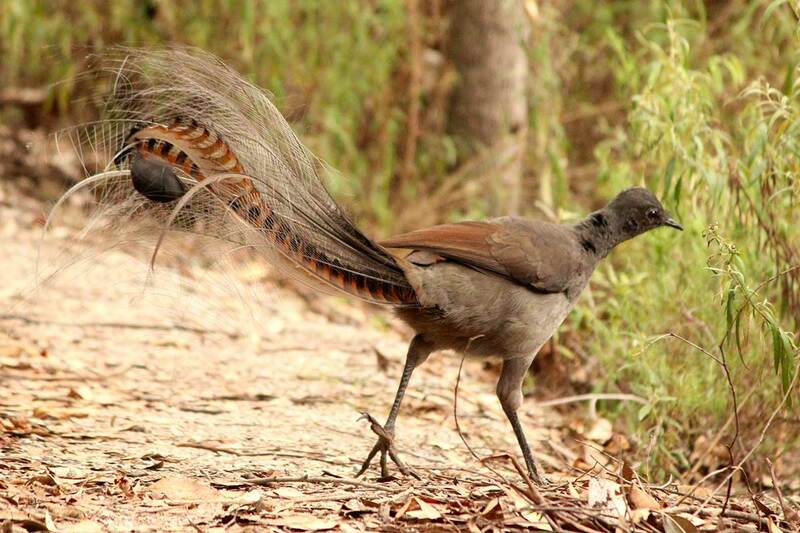 Superb Lyrebirds, Wonga Pigeons, Echidnas, kangaroos and wallabies, wombats, seals and dolphins, Eastern Whipbirds, five or more species of cuckoo, goannas (Lace Monitors), Gippsland Water Dragons are just the start. Next to the rainforests of East Gippsland – the wildlife jewel in the crown – for 4 days. This coastal rainforest and mountain forest region has the highest bird count in Australia for its size. Superb Lyrebirds, Wonga Pigeons, Echidnas, kangaroos and wallabies, wombats, seals and dolphins, Eastern Whipbirds, five or more species of cuckoo, goannas (Lace Monitors), Gippsland Water Dragons are just the start. This Australian tour is tailored for your interests, party size and duration. Contact us to request a quote. This package can run as All Private (ie just for your party) or All Shared. Shared tours operate at limited frequencies, so contact us early in your trip planning if you can. Shared tours operate with a total of 8 adult passengers. To the coast at the famous Great Ocean Road for 3 days – a region known for its scenery, but also a hotspot for wildlife. Koalas, Eastern Grey Kangaroos, Cape Barren Geese, Emus and Rufous Bristlebirds are some of the exciting species we see. Add on 2 days of Sea-lions, Kangaroo Island Kangaroos, Tammar Wallabies and more with Kangaroo Island wildlife specialist Exceptional Kangaroo Island. Flights from Adelaide to Kangaroo Island can be arranged on Day 15; or as a pre-trip. Add on 2 or 3 days in Phillip Island prior to the Wildlife Journey/East Gippsland section, to see Humpback Whales, Australian Fur Seals and seabirds on boat cruises with Wildlife Coast Cruises. Phillip Island is also famous for its Little Penguins. Read more about this option here. Add on 4 days before the Maximum Wildlife tour to visit Cairns in far north Queensland – famous for tree-kangaroos and cassowaries. 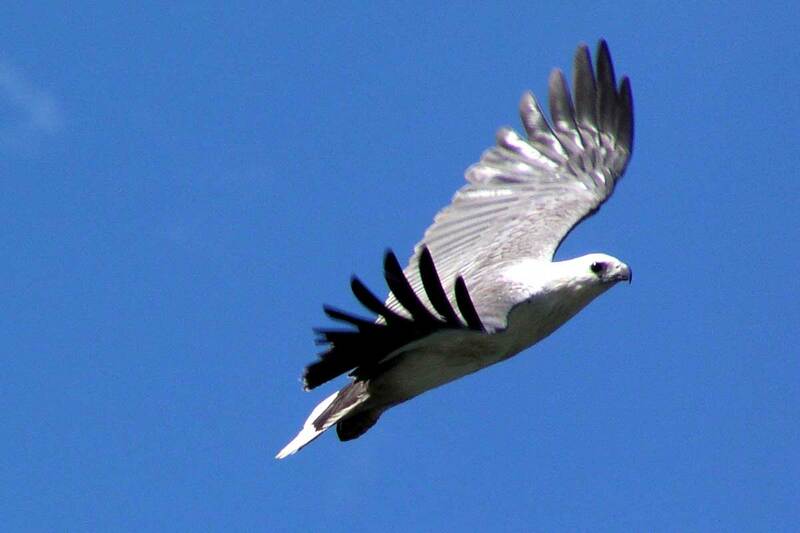 Travel with FNQ Nature Tours, the best wildlife operator in the region. Read more about this option here. Add on 4 days after Mungo Outback section to fly to Exmouth in Western Australia to swim with Whale Sharks with the experts: Exmouth Dive & Whalesharks Ningaloo. Read more about this option here. DAY 1: After an early pick up from your Darwin accommodation we’ll head eastwards into the tropical outback. On the way we’ll stop at a number of beautiful locations including famous Fogg Dam where we’ll take our first walk into a monsoon forest and view some of fantastic birdlife of the Northern Territory. We enter Kakadu National Park and stop at Mamukala Wetland and take a walk to get our first taste of the wonders of Kakadu. DAY 2: The Nourlangie region will be our first access to the magnificent Arnhem Land escarpment and its unique wildlife. We’ll visit a number of places in this region including the Nanguluwur Rock Art site, Anbangbang Billabong and Nourlangie Rock Art site. After a picnic lunch we’ll head back Anbinik for a siesta before heading back out to the bush to watch the sunset over the Kakadu escarpment from Nawurlandja lookout. Twilight often heralds the flight of tens of thousands of fruit bats winging their way silently through the tropical dusk – an incredible sight. DAY 3: We’ll take the Bardedjilidji Sandstone walk, an optional East Alligator River Cruise and visit Ubirr Rock Art Site. During the heat of the day we’ll return to Jabiru followed by a rest before heading back out in the afternoon to the nearby Iligadjarr Wetlands for a walk in a tropical savannah woodland beside the freshwater floodplain of the South Alligator River. DAY 4: Today we travel westward out of Kakadu to Point Stuart Wilderness Lodge beside Mary River National Park. On route we’ll stop at a number of special little places, We sometimes see Dingoes and the Antilopine Kangaroo. We’ll finish up at Point Stuart Wilderness Lodge, then take a walk through Jimmy Creek rainforest right beside the Lodge. The grounds of the Lodge abound with the beautiful little Agile Wallaby. Cockatoos and parrots of various species abound. DAY 5: The Mary River is famous for its abundant wildlife including some of the largest crocodiles in the world. This morning we can see crocodiles in their natural environment as we travel in a specially constructed boat to view them – and lots of other wildlife – on the Mary River. Lunch will be a picnic on high land overlooking the huge Mary River catchment. Late today we head as far north as we can go where the Mary River becomes a vast delta and floodplain 15 kilometres from the sea. DAY 6: Today we head out into the bush before sunrise for our last special Northern Territory wildlife walk at Bird Billabong in the Mary River National Park. This large wetland is nestled beside Mt Bundy Range. Thousands of birds move to this billabong as the surrounding country dries after the monsoon season. This is one of the wildlife tour highlights of the Top End. After a relaxing morning walk we’ll depart to Darwin, where you can board your afternoon flight to Melbourne. DAY 7: Depart Melbourne airport in the morning on a short flight (flight by others) to Mildura on the edge of the Outback. Your first stop will be at the junction of Australia’s two great rivers – the Murray and the Darling – where they meet in the Outback. The rest of the day is spent in the local region on walks searching for wildlife and birds beside the rivers and billabongs of the arid country. DAY 8: After an early rise we drive south to Hattah-Kulkyne National Park. We’ll spend the morning here and expect a high bird count on the way there and in the park itself. Hattah Kulkyne is also home to a wide range of reptiles including two species of large monitors and snakes and lizards. After lunch beside the lake system we head north to Lake Mungo in the Willandra Lakes World Heritage Area along straight dirt roads deep into the desert. Upon arrival we check into Mungo Lodge then begin walks and drives. DAY 9: We rise before sunrise for a light snack before heading off to explore the ancient “shoreline” of dry Lake Mungo. At this time of day wildlife abounds; cockatoos, parrots, kangaroos and emus are often seen in large numbers. We return to the Lodge for a relaxing brunch before meeting our Aboriginal Guide who will interpret the culture of this region. We drive across the dry bed of Lake Mungo to lunettes (wind-curved sand dunes) to begin a “story line” through 50,000 years of Aboriginal History beginning at the lake bed and rising high into the eroded dunes. Travelling by vehicle and on foot you will pass through 4 ecosystems ranging from dry lakebeds to rich sandy bush country. As the daylight fades we often see large numbers of both Western-grey and Red Kangaroos grazing beside the road. Emus abound. DAY 10: After an optional early morning bird walk we enjoy a final breakfast at Mungo Lodge before driving out of the desert to Mildura Airport where you fly out to your next adventure. Day 11: Stroll through a national park looking for wild koalas, cockatoos and kookaburras. Your Wildlife Guide and Koala Researcher will explain the behaviour and individuality of each of the Koalas you meet. 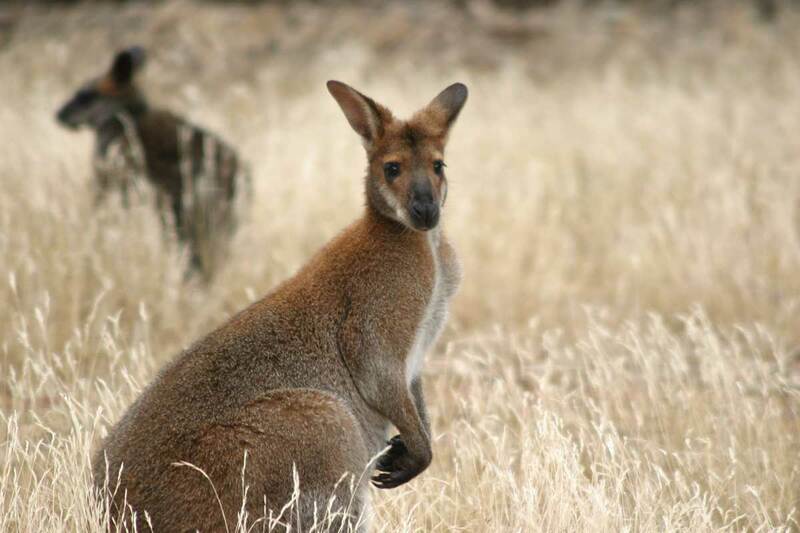 Walk quietly up to wild mobs of Kangaroos on the plains and in open Bushland. DAY 12: See some of the world’s most spectacular coastal scenery. We follow the Great Ocean Road to the surging surf coast, and walk in the magnificent rainforests of the Otway National Park. 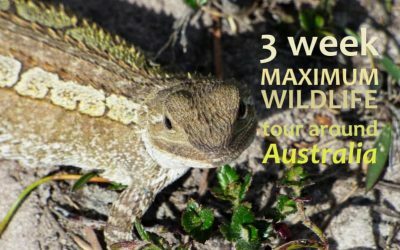 Travel through Port Campbell National Park, looking out for echidnas, wallabies, lizards and colourful birds which make their home in the coastal heathlands. Linger a while at the Twelve Apostles and the Loch Ard Gorge. DAY 13: This morning we have one last look at the coast in the dramatic morning light before returning to Melbourne across the vast grasslands of the Western Plains. We stop en route to drive to the top of an extinct volcano with spectacular views across the plains. From the summit we see some of the hundreds of volcanic lakes scattered across the plains. Later we pass Lake Corangamite, the largest permanent lake in Australia, often covered with prolific birdlife. We return to Melbourne in the late afternoon. DAY 14: free day in Melbourne. Optional birding tour to Western Treatment Plant. Alternatively, move this free day up to Day 7 to recover after the flight from Darwin to Melbourne. DAY 15: Travel past internationally acclaimed RAMSAR wetlands of the Lakes District of East Gippsland before travelling by ferry to an island sanctuary in the wetlands with a thriving colony of wild Koalas. We take a walk through the forest spotting these delightful animals in the wild, and learning about their lives. We may also see Echidnas, Wallabies and Kangaroos and many colourful parrots, honeyeaters and seabirds which you can help record for conservation purposes. DAY 16: After a relaxing breakfast we travel into the rugged mountain forests of East Gippsland. Today we will visit both dry and wet mountain forests, visit the famous Snowy River, and walk beside a wilderness creek where the landscape changes dramatically from the sunny, dry slopes to the near-rainforest of the gully. Your Wildlife Guide provides detailed information of the formation of these mighty forests, and helps you search for Lyrebirds, parrots, goannas, wallabies and honeyeaters. Birds and reptiles are abundant, but other human visitors are few. DAY 17: First we walk into a rainforest in search of birds and wallabies. Then we walk through a heathland and along a forest-lined river to its estuary. We search for Sea Eagles, cockatoos, kingfishers, swans and huge goanna lizards. We visit a quiet beach with a complex dune system and frequently see beach and ocean-going birds. After lunch we take a walk on the nearby rocky headland. We spend a little time on a beautiful beach removing old fishing nets. Our dinner tonight is a picnic in the bush overlooking the beach. On our way back to our Homestead we search the plains for wallabies, kangaroos and wombats. 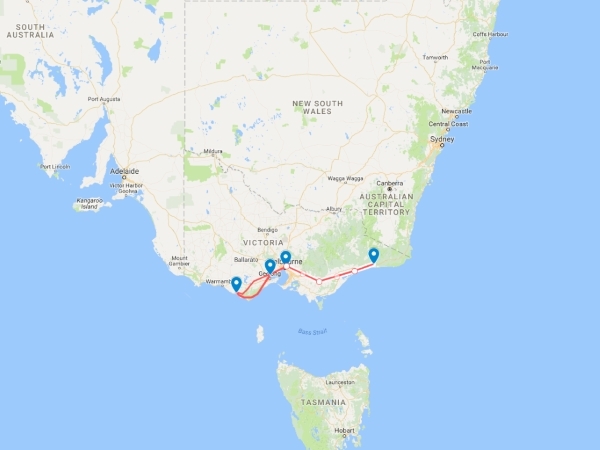 DAY 18: Today we head east away from the Snowy River area. We visit a large rainforest on the Bemm River, and later another, quite different rainforest on the Thurra River. At the end of the day we arrive at Gipsy Point in Croajingolong National Park. DAY 19: We will explore the magnificent forest, river and lake systems of Mallacoota Inlet. This evening travel to a secluded river where you may see one of Australia’s most elusive mammals, the platypus, in a beautiful location. 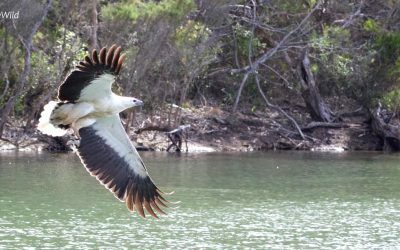 DAY 20: We take a slow boat cruise up one of the hidden rivers that feed Mallacoota Inlet looking for White-bellied Sea-eagles, Gippsland Water Dragons and Azure Kingfishers. DAY 21: Our last day – transfer to Merimbula airport (just 1.5 hours away) for a short flight to Sydney or Melbourne. Depending on flight times we can take a morning bushwalk near Gipsy Point. 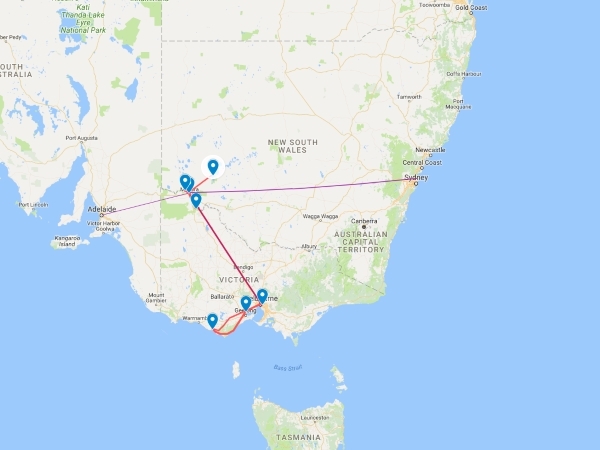 DAY 1: Depart Melbourne airport in the morning on a short flight (flight by others) to Mildura on the edge of the Outback. Your first stop will be at the junction of Australia’s two great rivers – the Murray and the Darling – where they meet in the Outback. The rest of the day is spent in the local region on walks searching for wildlife and birds beside the rivers and billabongs of the arid country. DAY 2: After an early rise we drive south to Hattah-Kulkyne National Park. We’ll spend the morning here and expect a high bird count on the way there and in the park itself. Hattah Kulkyne is also home to a wide range of reptiles including two species of large monitors and snakes and lizards. After lunch beside the lake system we head north to Lake Mungo in the Willandra Lakes World Heritage Area along straight dirt roads deep into the desert. Upon arrival we check into Mungo Lodge then begin walks and drives. DAY 3: We rise before sunrise for a light snack before heading off to explore the ancient “shoreline” of dry Lake Mungo. At this time of day wildlife abounds; cockatoos, parrots, kangaroos and emus are often seen in large numbers. We return to the Lodge for a relaxing brunch before meeting our Aboriginal Guide who will interpret the culture of this region. We drive across the dry bed of Lake Mungo to lunettes (wind-curved sand dunes) to begin a “story line” through 50,000 years of Aboriginal History beginning at the lake bed and rising high into the eroded dunes. Travelling by vehicle and on foot you will pass through 4 ecosystems ranging from dry lakebeds to rich sandy bush country. As the daylight fades we often see large numbers of both Western-grey and Red Kangaroos grazing beside the road. Emus abound. DAY 4: After an optional early morning bird walk we enjoy a final breakfast at Mungo Lodge before driving out of the desert to Mildura Airport where you fly out to Melbourne. Day 5: Stroll through a national park looking for wild koalas, cockatoos and kookaburras. Your Wildlife Guide and Koala Researcher will explain the behaviour and individuality of each of the Koalas you meet. Walk quietly up to wild mobs of Kangaroos on the plains and in open Bushland. DAY 6: See some of the world’s most spectacular coastal scenery. We follow the Great Ocean Road to the surging surf coast, and walk in the magnificent rainforests of the Otway National Park. 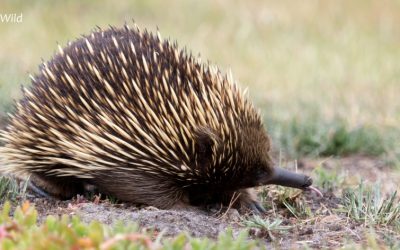 Travel through Port Campbell National Park, looking out for echidnas, wallabies, lizards and colourful birds which make their home in the coastal heathlands. Linger a while at the Twelve Apostles and the Loch Ard Gorge. DAY 7: This morning we have one last look at the coast in the dramatic morning light before returning to Melbourne across the vast grasslands of the Western Plains. We stop en route to drive to the top of an extinct volcano with spectacular views across the plains. From the summit we see some of the hundreds of volcanic lakes scattered across the plains. Later we pass Lake Corangamite, the largest permanent lake in Australia, often covered with prolific birdlife. We return to Melbourne in the late afternoon. DAY 8: free day in Melbourne. Optional birding tour to Western Treatment Plant. DAY 9: Travel past internationally acclaimed RAMSAR wetlands of the Lakes District of East Gippsland before travelling by ferry to an island sanctuary in the wetlands with a thriving colony of wild Koalas. We take a walk through the forest spotting these delightful animals in the wild, and learning about their lives. We may also see Echidnas, Wallabies and Kangaroos and many colourful parrots, honeyeaters and seabirds which you can help record for conservation purposes. DAY 10: After a relaxing breakfast we travel into the rugged mountain forests of East Gippsland. Today we will visit both dry and wet mountain forests, visit the famous Snowy River, and walk beside a wilderness creek where the landscape changes dramatically from the sunny, dry slopes to the near-rainforest of the gully. Your Wildlife Guide provides detailed information of the formation of these mighty forests, and helps you search for Lyrebirds, parrots, goannas, wallabies and honeyeaters. Birds and reptiles are abundant, but other human visitors are few. DAY 11: First we walk into a rainforest in search of birds and wallabies. Then we walk through a heathland and along a forest-lined river to its estuary. We search for Sea Eagles, cockatoos, kingfishers, swans and huge goanna lizards. We visit a quiet beach with a complex dune system and frequently see beach and ocean-going birds. After lunch we take a walk on the nearby rocky headland. We spend a little time on a beautiful beach removing old fishing nets. Our dinner tonight is a picnic in the bush overlooking the beach. On our way back to our Homestead we search the plains for wallabies, kangaroos and wombats. DAY 12: Today we head east away from the Snowy River area. We visit a large rainforest on the Bemm River, and later another, quite different rainforest on the Thurra River. At the end of the day we arrive at Gipsy Point in Croajingolong National Park. DAY 13: We will explore the magnificent forest, river and lake systems of Mallacoota Inlet. This evening travel to a secluded river where you may see one of Australia’s most elusive mammals, the platypus, in a beautiful location. DAY 14: We take a slow boat cruise up one of the hidden rivers that feed Mallacoota Inlet looking for White-bellied Sea-eagles, Gippsland Water Dragons and Azure Kingfishers. DAY 15: Our last day – transfer to Merimbula airport (just 1.5 hours away) for a short flight to Sydney or Melbourne. Depending on flight times we can take a morning bushwalk near Gipsy Point. Day 1: Stroll through a national park looking for wild koalas, cockatoos and kookaburras. Your Wildlife Guide and Koala Researcher will explain the behaviour and individuality of each of the Koalas you meet. Walk quietly up to wild mobs of Kangaroos on the plains and in open Bushland. DAY 2: See some of the world’s most spectacular coastal scenery. We follow the Great Ocean Road to the surging surf coast, and walk in the magnificent rainforests of the Otway National Park. 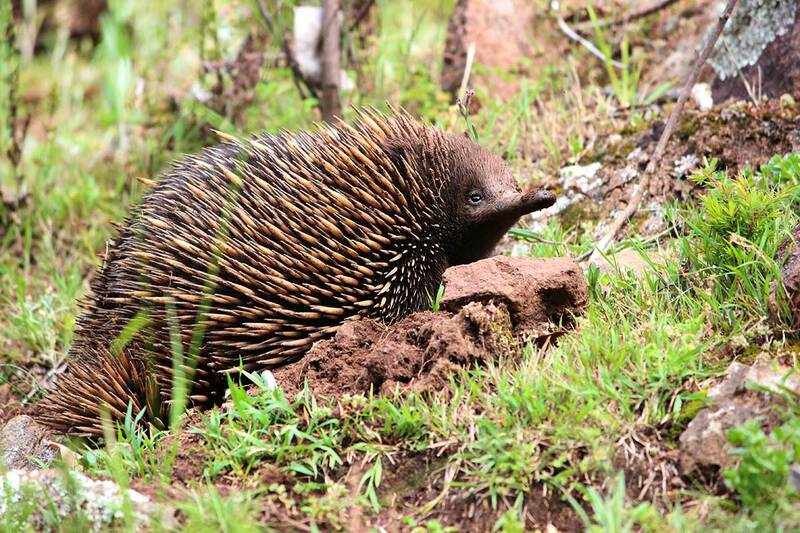 Travel through Port Campbell National Park, looking out for echidnas, wallabies, lizards and colourful birds which make their home in the coastal heathlands. Linger a while at the Twelve Apostles and the Loch Ard Gorge. DAY 3: This morning we have one last look at the coast in the dramatic morning light before returning to Melbourne across the vast grasslands of the Western Plains. We stop en route to drive to the top of an extinct volcano with spectacular views across the plains. From the summit we see some of the hundreds of volcanic lakes scattered across the plains. Later we pass Lake Corangamite, the largest permanent lake in Australia, often covered with prolific birdlife. We return to Melbourne in the late afternoon. DAY 4: Travel past internationally acclaimed RAMSAR wetlands of the Lakes District of East Gippsland before travelling by ferry to an island sanctuary in the wetlands with a thriving colony of wild Koalas. We take a walk through the forest spotting these delightful animals in the wild, and learning about their lives. We may also see Echidnas, Wallabies and Kangaroos and many colourful parrots, honeyeaters and seabirds which you can help record for conservation purposes. DAY 5: After a relaxing breakfast we travel into the rugged mountain forests of East Gippsland. Today we will visit both dry and wet mountain forests, visit the famous Snowy River, and walk beside a wilderness creek where the landscape changes dramatically from the sunny, dry slopes to the near-rainforest of the gully. Your Wildlife Guide provides detailed information of the formation of these mighty forests, and helps you search for Lyrebirds, parrots, goannas, wallabies and honeyeaters. Birds and reptiles are abundant, but other human visitors are few. DAY 6: First we walk into a rainforest in search of birds and wallabies. Then we walk through a heathland and along a forest-lined river to its estuary. We search for Sea Eagles, cockatoos, kingfishers, swans and huge goanna lizards. We visit a quiet beach with a complex dune system and frequently see beach and ocean-going birds. After lunch we take a walk on the nearby rocky headland. We spend a little time on a beautiful beach removing old fishing nets. Our dinner tonight is a picnic in the bush overlooking the beach. On our way back to our Homestead we search the plains for wallabies, kangaroos and wombats. DAY 7: This morning we depart East Gippsland after one last visit to the beach at the Mouth of the Snowy River. On the way back to Melbourne we visit the Krowathunkoolong Keeping Place, an informative Aboriginal Cultural Centre in Bairnsdale. We also search for Grey-headed Flying-foxes in their daytime roosts beside the river at Bairnsdale.